Potato virus Y (PVY) is a major cause of yield and quality loss in potato crops worldwide. Recently, populations of PVY strains have shifted dramatically toward recombinant strains such as PVYNTN and PVYN:O. A 2010 to 2016 survey of PVY strains in commercial fields of New Brunswick (NB), Canada, and five field trials tracking PVY spread in NB and Manitoba, were conducted to study the current status of PVY strains and their relative rates of spread. In NB, PVYO dropped from 82% of infections in 2010 to 14% in 2016, replaced mostly by PVYNTN (64%) and PVYN:O (22%).In field trials with Russet Burbank and Gold rush varieties, PVYNTN spread most effectively compared to PVYN:O and PVYO. 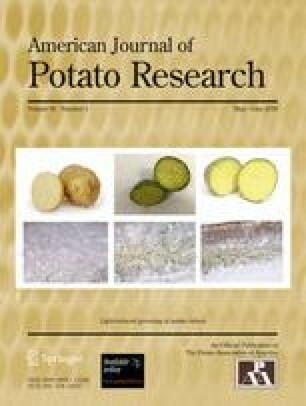 Strain-specific PVY spread varied with the potato variety, possibly due to selective PVYO resistance in Goldrush, mostly expressed at the plant-to-plant transmission level with little difference in transduction to tubers in infected plants. Relevance of in-field differences in spread of strains to changes in regional PVY populations, and potential mechanisms responsible, are discussed. El virus Y de la papa (PVY) es una causa importante de pérdida de rendimiento y calidad en los cultivos de papa en el mundo. Recientemente, las poblaciones de las variantes de PVY han girado dramáticamente hacia recombinantes, tales como el PVYNTN y PVYN:O. Se condujo un estudio de 2010 a 2016 de las variantes de PVY en campos comerciales de New Brunswick (NB), Canada, y cinco ensayos de campo, siguiendo la huella de la dispersión en NB y Manitoba, para estudiar el estatus actual de las variantes del PVY y sus niveles relativos de dispersión. En NB, PVYO bajó de 82% de infecciones en 2010 a 14% en 2016, reemplazado mayormente por PVYNTN (64%) y PVYN:O (22%). En ensayos de campo con las variedades Russet Burbank y Goldrush, el PVYNTN se dispersó más efectivamente comparado con PVYN:O y PVYO. La dispersión específica por variante varío con la variedad de papa, posiblemente debido a la resistencia selectiva al PVYO en Goldrush, mayormente expresada en el nivel de la transmisión de planta a planta, con poca diferencia en la transducción a tubérculos en plantas infectadas. Se discuten la relevancia de las diferencias en el campo en la dispersión de las variantes a cambios en las poblaciones regionales de PVY, y mecanismos potenciales responsables. The authors thank the Agriculture and Agri-Food Canada and Canadian Horticultural Council – Science cluster, Growing Forward 2 and the New Brunswick Embracing Innovation in Agriculture and Agri-Food Program for funding this research. We also thank the many staff members of ACS Inc., Gaia Consulting Ltd. (Manitoba) and the New Brunswick Department of Agriculture, Aquaculture and Fisheries for their help, particularly with the large amount of field work and maintenance required for these field trials. We also thank Dr. Jari Valkonen for helpful consultations during the manuscript revision process. Davie, K., R. Holmes, J. Pickup, and C. Lacomme. 2017. Dynamics of PVY strains in field grown potato: Impact of strain competition and ability to overcome host resistance mechanisms. Virus Research. https://doi.org/10.1016/j.virusres.2017.06.012. Mondal, S., and S.M. Gray. 2017. Sequential acquisition of Potato virus Y strains by Myzus persicae favors the transmission of the emerging recombinant strains. Virus Research. https://doi.org/10.1016/j.virusres.2017.06.023. R Core Team. 2017. R: A language and environment for statistical computing. R Foundation for Statistical Computing, Vienna, Austria. http://www.R-project.org.